The number of sales was 1308 in 2005 falling to 833 in 2009. 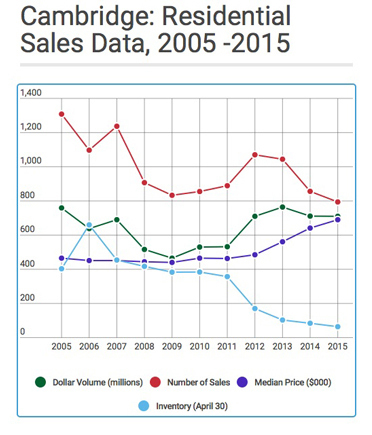 Sales grew to 1070 in 2012 but has fallen to 794 in 2015 (estimated), due to significantly lower inventory. Median prices remained stable from 2005 to 2011. From 2011 to 2015 median prices appreciated an astonishing 49% from $463,000 to $690,000. This appreciation cycle correlates to a steep decline in inventory and the strong economic recovery in Greater Boston. There were 403 units on the market on April 30, 2005 and rose to a peak of 660 units on April 30, 2006. Inventory fell steadily from 2007 - 2015. On April 30, 2015 there were only 64 units on the market. This dramatic decline in inventory has led to bidding wars and a sharp increase in median prices. Note: 2015 data includes under agreement properties scheduled to close by December 31, 2015.